I TRY TO BE SNEAKY. Really, I do. But with a bulky camera slung around my neck or gripped in my right hand, I don’t exactly blend into the landscape. Still I attempt to go unnoticed, because I aim to capture natural images through my camera lens. 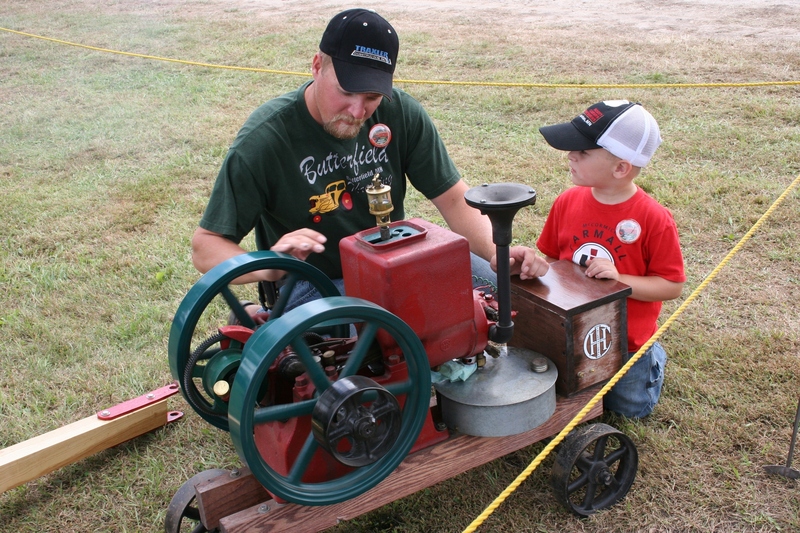 This past weekend, I attended the Rice County Steam & Gas Engines Show in rural Dundas. I knew this event would provide plenty of photographic opportunities, especially for photographing interesting people. So I scanned the crowd, worked the crowd and walked the show grounds with carefree abandon. It helped tremendously that a few others carried cameras like mine, some even bigger and better. After awhile, attendees seemed not to notice us camera geeks or, if they did, they didn’t interfere or run away (except for one teenage girl in the summer kitchen). That said, I want to share with you some of the people shots I captured. Next time you’re out and about, take time to study the individuals you meet. Notice their faces, their expressions, their mannerisms, their clothing, their interactions with others. Everyone can be a photo, even a story, even a new friend if you pause in the busyness of your life to notice and celebrate the differentiating qualities that distinguish us as individuals. Jason and his son Austin, 4, from LeCenter, captured my attention, and my heart, immediately. The loving bond behind the two is obvious. It shows in the way Austin watches his dad and in the way Jason takes time to share his passion for engines with his admiring boy. I cannot get over how folks at the gas and steam engines show are so loyal to a brand. 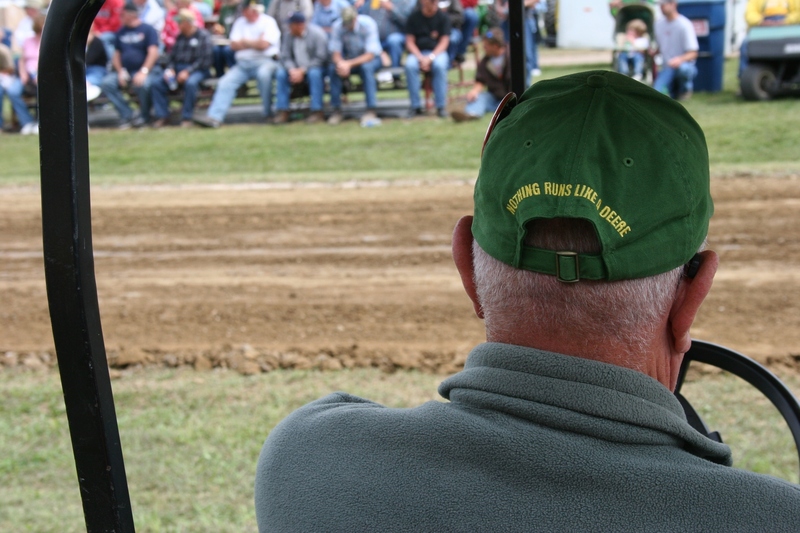 Product branding is everywhere, even on the back of this cap worn by a John Deere devotee seated in a golf cart for the tractor pull. 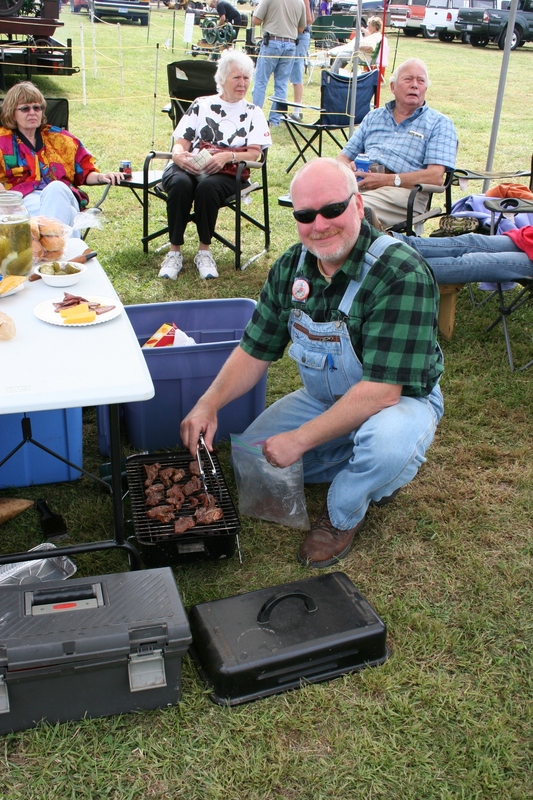 "We're a band of gypsies," Erik of Bloomington tells me as I watch him grill marinated beef tenderloin in his family's exhibit area. They are gypsies, he explains, because they travel from show to show. Although a city boy, Erik inherited his love of old engines from his collector dad, also a city boy. I wondered how this man could nap during the noisy tractor pull. This is one of my favorite photos. 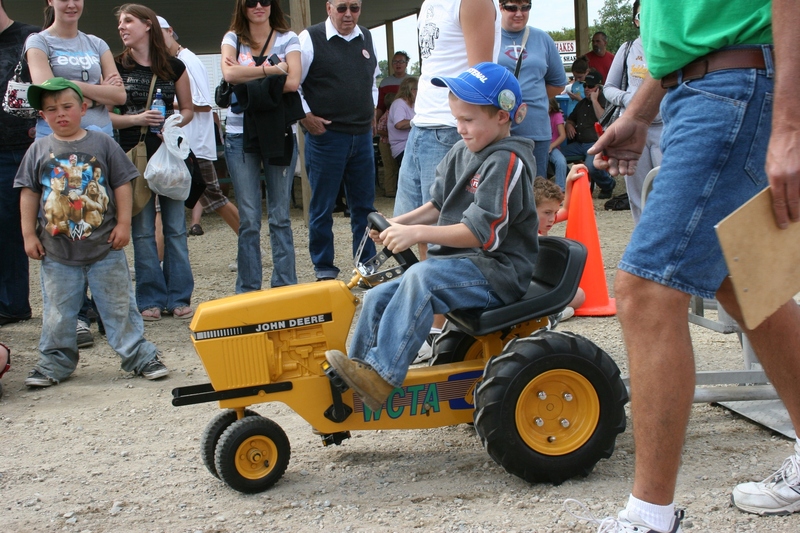 First, I noticed the determined look of the boy riding the tractor in the pedal tractor pull competition. Then, only after I had uploaded photos to my computer, did I notice the boy on the left in the World Wrestling Federation t-shirt standing with his green cap tipped to the side. Doesn't he look just like Spanky from The Little Rascals or Beaver from Leave It to Beaver? I smile every time I view this image. 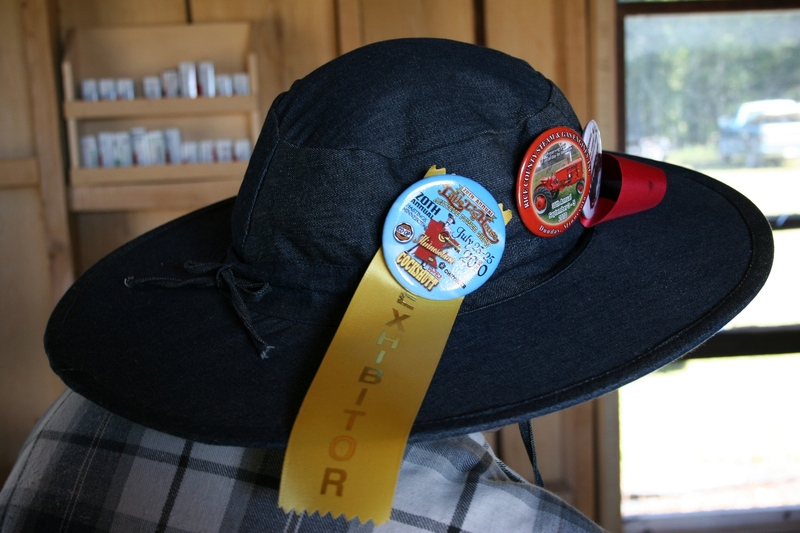 One of the many memorable fashions worn at the gas and steam engines show. 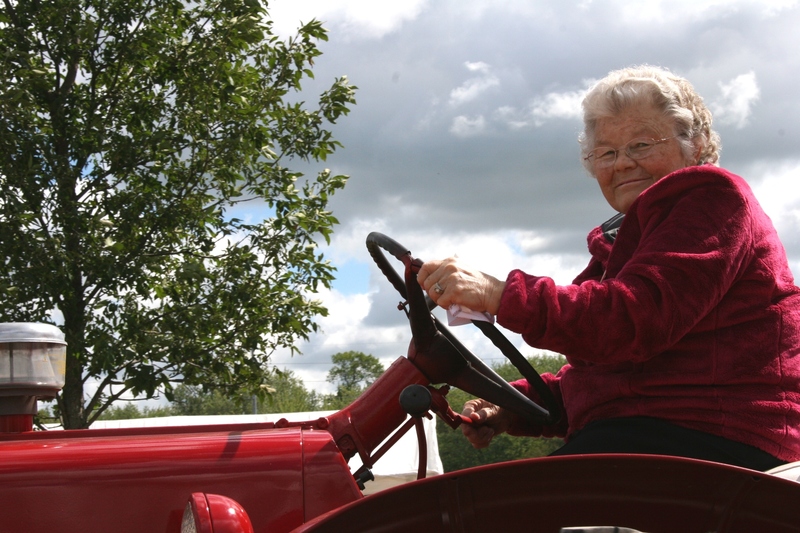 This woman drives a tractor in the tractor parade. I love her face, her happy, happy face. 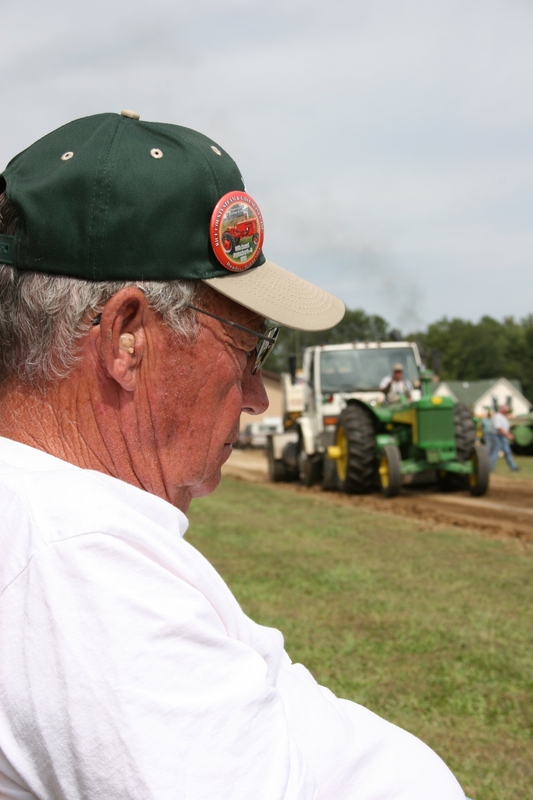 When it comes to driving tractors, age and gender don't matter. 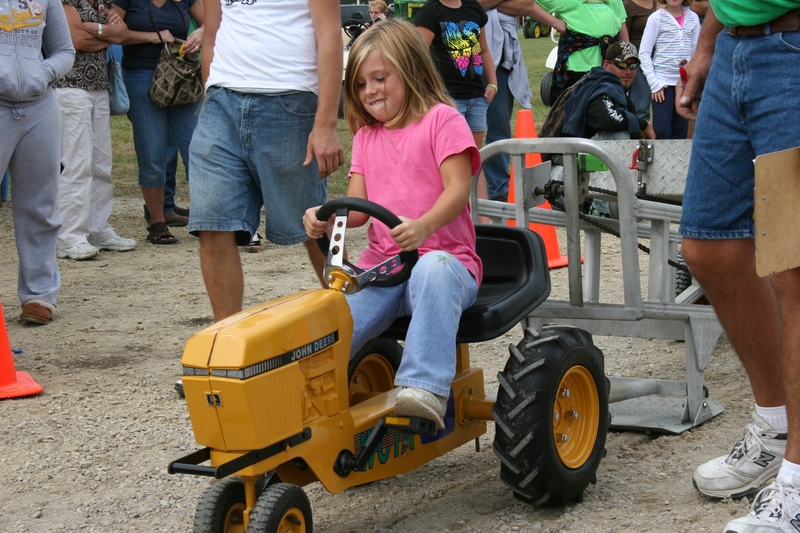 This determined girl vies in the pedal tractor pull. 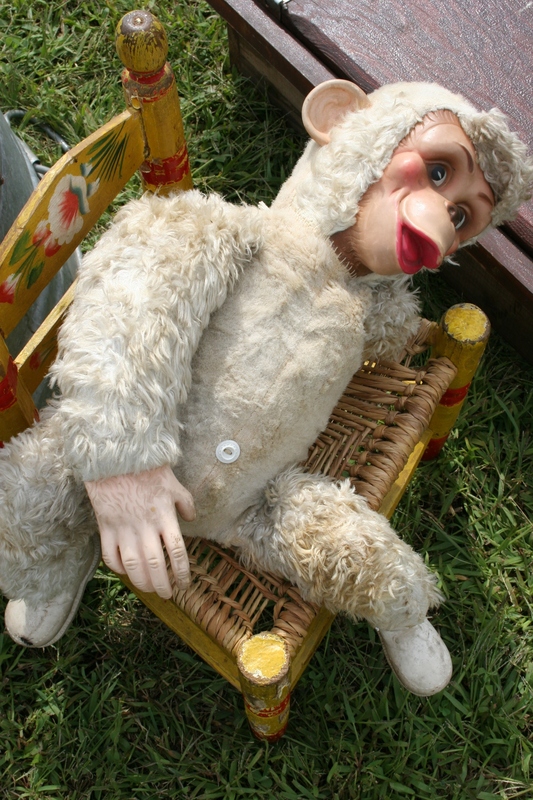 Just because I like monkeys, I photographed this flea market monkey.